Thanks to our reader, Philip, for this great story. 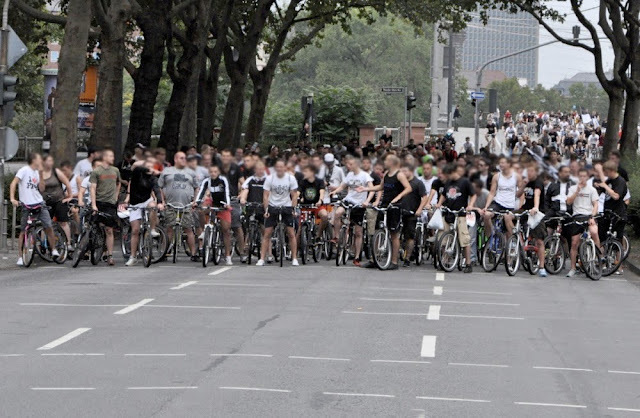 The fans of Eintracht Frankfurt football club decided to ride their bicycles to this year's derby match against local rivals FSV Frankfurt on August 21, 2011. The result was a fantastic and festive "football critical mass" from the city centre to the stadium. 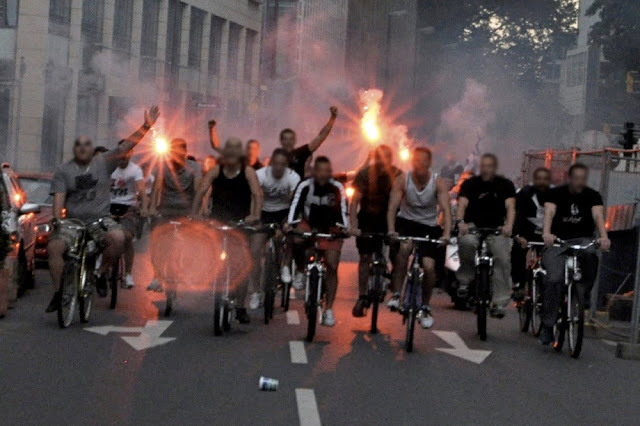 It was probably even more festive afterwards, since Eintracht Frankfurt cycled home with a solid 0-4 victory over their rivals. Back when the word 'hooligans' was splashed over the press in the 1990s, the Danish fans started calling themselves 'roligans' - from the Danish word 'rolig', meaning 'calm'. The fans in the above photos could easily be dubbed 'Roll-igans' or even 'rad-igans'. Mainly because 'Pedaligans' just sounds stupid. More photos over at Ultras Frankfurt 1997 website. Here's a film from a couple of years ago of Felix and I riding home from an FC Copenhagen match.